Harvest Methods - North Pacific Seafoods, Inc.
Fishermen use a variety of methods to harvest Alaska fish and shellfish, depending on the species. All methods are monitored and regulated to ensure that only targeted fish or shellfish of a certain size are caught. Gear types are also limited to specific harvesting areas and species. Troll vessels catch salmon by trolling bait or lures through concentrations of feeding salmon. Each boat fishes an average of four wire lines with 8 to 12 leaders spaced out on each. A baited hook or lure is attached to each leader to attract the fish. Once caught, each salmon is handled individually, and dressed and iced on board. Used in Southeast Alaska, salmon trolling produces limited quantities of premium quality fish, mostly king and coho salmon. 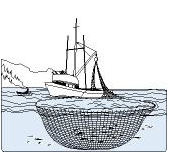 Purse seiners catch salmon by encircling them with a large, tight mesh net. The net is towed from the fishing boat around a group of fish by a skiff, which returns to the boat to complete a circle. Then the bottom of the net is drawn tightly closed, or "pursed," to capture the fish before it is hauled aboard. Most seiners are equipped with systems that circulate chilled water to cool the fish after harvest. Purse seining is used in most parts of Alaska to catch coho, chum and pink salmon. Gillnets are set in coastal areas across the path of returning salmon. Most gillnetting is done using small one- or two-person boats that drift as they allow the net to "soak." Some gillnetting is also done from the shore. When salmon swim into gillnets their heads are caught just behind the gill plate. The mesh openings in the net are regulated to ensure that they catch only fish of a desired size. The nets are hauled aboard the fishing boat by a hydraulic drum, and the fish are removed from the net by hand. Gillnets are mainly used in Bristol Bay and in limited areas throughout Alaska to catch king, coho, chum and sockeye salmon. Longliners catch halibut and blackcod using a long weighted line that is laid on the ocean bottom. Multiple leaders with baited hooks are attached to the longline to attract the fish. The lines are anchored in place and left to "soak" for approximately 24 hours. The vessel then hauls the lines with the hooked fish aboard using a power winch. The fish are often dressed, bled, and packed in ice on board the vessel. Most whitefish, except halibut, are caught using a large trawl net, a long cone-shaped net that is towed behind the fishing vessel. The nets have steel "doors" which keep the mouth of the net open as it is towed. When the net is towed through a concentration of fish, the fish enter the mouth of the net and are captured at the end of the cone, or the "cod end." Some whitefish, such as cod and rockfish, are also caught using automatic jigging equipment. Each boat fishes two to four lines, each with baited hooks and a weight on the bottom. The lines are automatically moved, or "jigged," up and down to attract the fish. In most cases, jigged fish are dressed and iced on board immediately after harvest.